In many models of automobile GPS trackers there is a built-in detector of harsh driving. It constantly controls value of accelerations during speed-ups, braking and turns. If they pass the limit values, the system fixes the corresponding event. Further these “Harsh driving” events can be controlled by means of notifications and reports. As technical characteristics for different vehicles are different, critical values of accelerations will be various. For example, a sedan can accelerate faster than a bus. 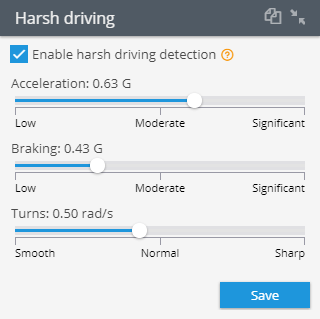 Therefore, it is possible to flexibly control the parameters of the “Harsh driving” detector or use recommended value for this type of vehicle. You can establish three ranges of speeds and specify limit values of accelerations. The example given above means that if in 5 seconds speed will change at the specified value or more, the event “Harsh driving” will be fixed.